Sunil did his PUC from 2011-2012. 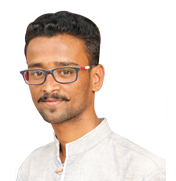 Following this, he participated in the Deshpande Susandhi Fellowship Program in 2013, in which he learned English, Communication and Computer Skills. After the fellowship, he joined LEAD as the Office Assistant and, after 2 months, began managing the program's logistics. Sunil finds Deshpande Foundation culture amazing, and loves working in the LEAD program as it is improving his English, communication, networking and leadership skills immensely.